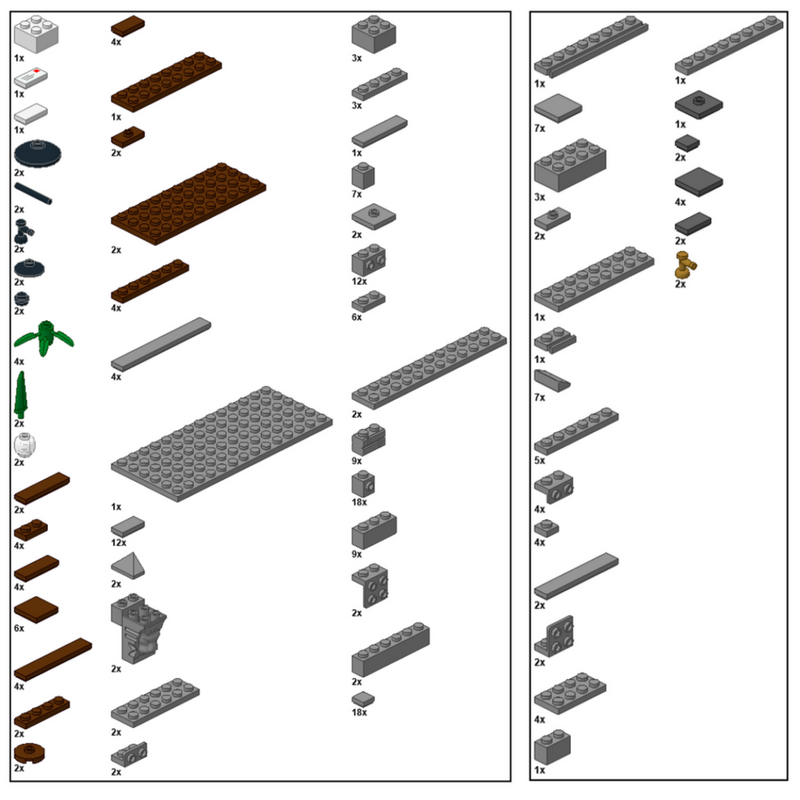 Every build available for download on Bricks-to-go.com comes with both a visual parts list, and an XML parts list. The visual parts list is exactly what it sounds like; a visual representation of every piece within the build with colours and quantities. It can be found at the end of each building instruction PDF file. However, the XML Parts list looks much different, and comes in a separate file from the building instructions and visual parts list. 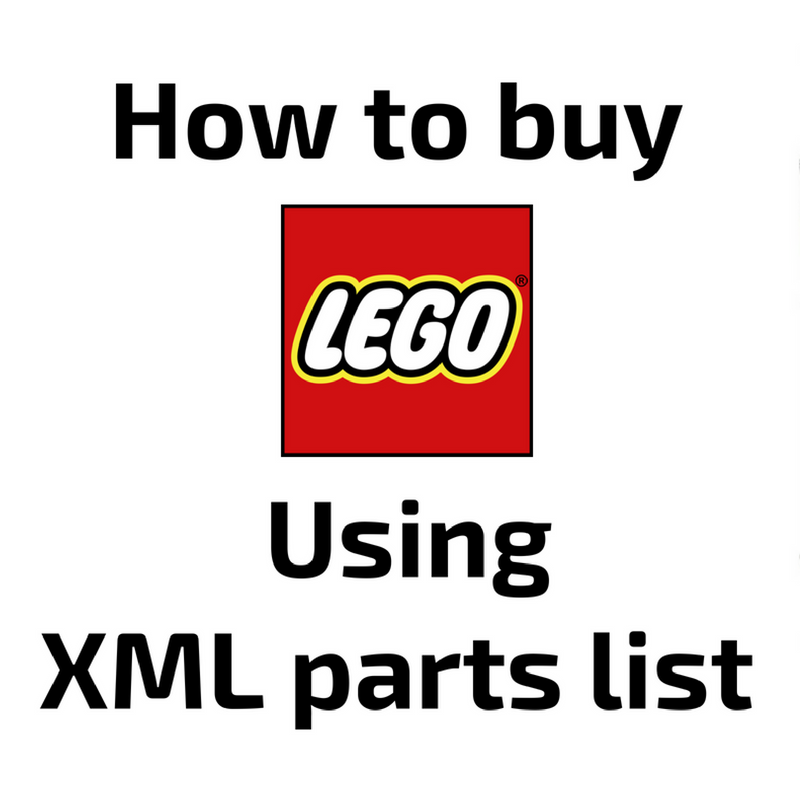 So What is an XML Parts List and How is it Useful? Since the builds available here at Bricks-to-go.com are only instructions, you may need to purchase any missing pieces before you start building. This can be incredibly tedious and time consuming as you search for each and every individual Lego piece in the entire build. XML parts lists eliminate this heinous task, making it much easier for you to purchase the pieces you need, while skipping the ones you don’t. The first thing you’ll need to do is create an account for Bricklink.com. This is where you’ll input the XML file and purchase your pieces. Once you’ve logged in to your account, click on the “Want” tab at the top of the page. Then switch to “Upload Bricklink XML Format”. You can also change the destination for your wanted list by “Creating a New Wanted List” and giving it a name. Copy and paste the text from the XML file into the text box in Bricklink. Then click on “Verify Items”. Here is where you’ll be able to edit your list before placing any orders. Most of the filters on this page I leave blank, but there are a few that you should take note of. Condition: You can select between new or used pieces. Used pieces tend to be slightly less expensive, but may show wear and tear. I recommend leaving this blank and letting Bricklink choose the best options for you. Quantity: If you have some but not all of the required number of a specific piece, you can change the quantity you’d like to purchase here. 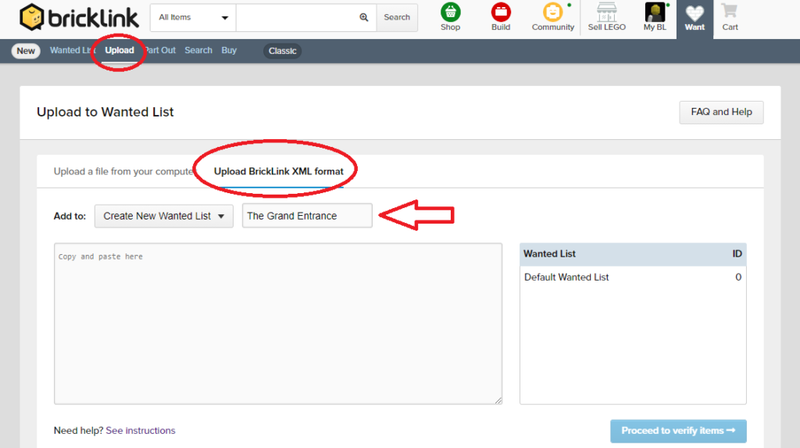 Exclude: If you already have all of the required number of a specific piece, you can choose to not order any of that piece at all by excluding the piece from your list. 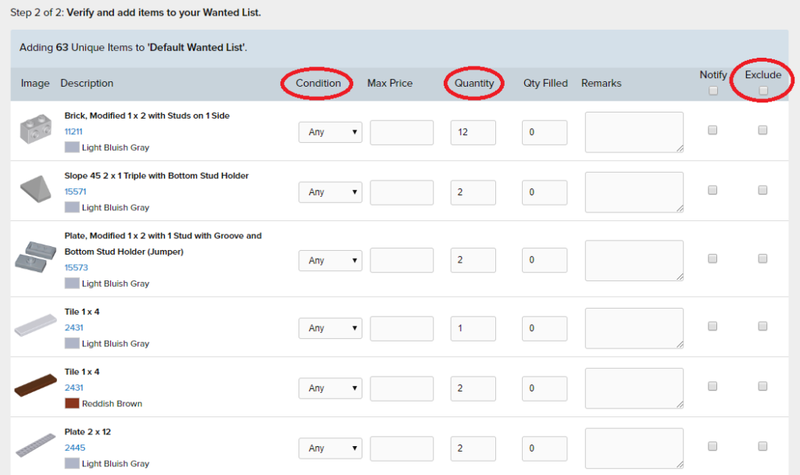 Once you’ve made the necessary adjustments to your list, scroll to the bottom of the page and click on “Add to Wanted List”. You can now view your parts list within Bricklink by following the link to view “YOUR LIST NAME”, or go to your want list from the want tab at top of the page. When you’re ready to start placing your order, click on “Buy All”. Here you’ll be able to filter out certain stores to cater to your purchasing needs. Store location: If possible, choose local stores to order from. This means cheaper and faster shipping. Store accepts: Choose which currency you’d prefer the store to accept. This becomes much less of a problem when buying local as well. Once you have finished choosing your filter options, click on “Auto-Select”. Bricklink will then automatically generate a list of stores that will provide you with all the pieces that you need, and automatically create the necessary carts ready for checkout. It will also display an estimated subtotal for your order before shipping costs. The only thing you’ll have left to do is to review the cart and shipping costs, then place your orders! And that’s it! Once the invoice arrives from the store, you can pay for your order (unless there’s an instant pay option) and your pieces will be on the way in no time! Visit the building instructions page to download instructions of your own and get your pieces ordered without any hassle!